I don’t watch much television. I drool over Project Runway each week, look forward to every episode of evangelical preacher T.D. Jakes‘ show, and try to catch Fr. Benedict Groeschel’s Sunday Night Live whenever I can. There are few other shows that capture my attention. So it is with great bewilderment that I admit that I am just barely able to resist the urge to follow entire season of Paris Hilton’s My New BFF. I stumbled across it the other day and, well, let’s just say that that’s 20 minutes of my life that I can never get back. The premise is that various tanned twenty-somethings ruthlessly try to be Paris Hilton’s “best friend forever” even as she leaves their events early, talks on her cell phone instead of listening to them, and eliminates losers via text messages that end with “see you never.” I couldn’t look away. Please pray that I never watch this show again. If you are a football-loving Aggie from Houston, I just want to tell you that I am sorry. These are dark days, indeed. I keep expecting that one of these days the teachers at our parish Mother’s Day Out program will start charging admission to let people watch me try to pick up four-year-old DB and two-year-old LC on the days that my mom can’t watch baby LM while I’m there. Last Thursday was such a day. I had baby LM in an umbrella stroller. I picked up DB from his class, having him wear his backpack and walk beside me while I carried his lunchbox. Redheaded LC started melting down as soon as I got to her class and insisted on being held. She refused to wear her backpack. As I struggled in vain to find a way to attach the small handle of her lunchbox to the stroller, I took a moment to hate myself for the decision to buy large retro aluminum lunchboxes that don’t fit in toddler backpacks because I thought it’d be a fun, kitchy throwback to my childhood. Then DB decided that this moment would be a good time to refuse to push the baby’s stroller. So there I was, a loud and squirmy redhead on my hip, barely holding on to two metal lunchboxes and a pink princess backpack, trying to somehow push the baby’s stroller with my hip, when the teacher hands me LC’s artwork from the day: a willowy 11×14 piece of construction paper covered in bright red paint that was still wet. At that point I was just waiting for the teacher to tell me that it was our day to take home the class pet hyena and the Faberge egg collection. I handed the painting to DB and it immediately slipped from his hands and onto the floor. Anyone want to guess which side it landed on? Yeah. As the teacher peeled the paper off the carpet to reveal large, red blotches, she insisted that I just go and she’d take care of it, but not before taking a moment to look up and exclaim, “You really have your hands full!” Truer words. 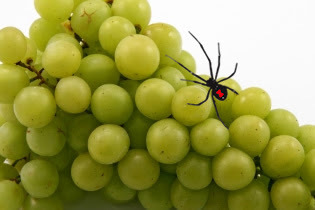 THIS IS WHAT A BLACK WIDOW SPIDER IN GRAPES LOOKS LIKE. Sorry about #4, I was just trying to vindicate myself by pointing out my keen ability to recognize arachnids of the genus Latrodectus when they’re SITTING IN A BUNCH OF GRAPES. Sunday I was at HEB and couldn’t help but notice something very black and spidery moving around in the bag of grapes that sat right next to my son’s leg. I picked up the bag to see a half-dead spider whose frightening shape I thought I recognized. I held up the bag to examine the bottom of the spider’s body, and announced colorfully to everyone within a 50-foot radius that this spider, indeed, was marked with a red hourglass. It was a black widow. “OK, if you say so, ” he said dismissively. At this point another employee walked by, and my checker handed him the grapes casually and said, “She doesn’t want these because she thinks there’s a bad spider in it.” I was fumbling for my wallet but looked up in time to see him catch the other employee’s eye and shake his head no. None of the above representations of my part of the conversation at HEB are accurate. It’s what I imagine myself doing if I were to have a single confrontational bone in my body. Actually I just said a couple things and laughed nervously. Why do I seem to be the only blogger who’s concerned that Bloglines hasn’t updated my feed in a week? It’s happening to everyone on Blogger with custom domains, yet a few Google searches indicate that I am the only person losing my mind slightly concerned about this. Kudos to the rest of you for being detached from worldly things like large percentages of your readers thinking that you’ve stopped blogging! Those are my thoughts from so far this week. Have a nice Tuesday night! Thank you for a good laugh this morning. I really needed that! Ah, yes these are dark days for the Aggie and Texan fans. My husband is a huge Texans fan and I am an Aggie. Bloglines has been weird a lot lately. Don’t like Google Reader because of the sharing aspect. Don’t like Google knowing everything about me either. According to USA Today, the black widow in your grapes should be a reassuring sign that your children are not eating chemicals that cause cancer and birth defects. I am confident you find this reassuring. I knew there was a problem with Bloglines updating, and a problem with feeds on the site I write for, but didn’t catch the connections until you mentioned them. How frustrating! I don’t want to switch feed readers — it would just be an annoying pain to copy all the feeds over and learn a new user interface. Le sigh. I would certainly be banging on your door demanding an explanation if I hadn’t seen any new posts from you in a week. Luckily, Google Reader is quite efficient (although ironically I’ve been getting your posts through twice all week). Very funny notes. Sorry about the spider, thankfully you noticed it before anyone ate it. Ick. I can’t even discuss the Aggies. It’s too depressing. However, it’s not as bad as a black widow in my grapes. And for some reason, most of the time a week goes by where I see no new posts on your site – then one day I see 4 at once, all posted at different times over the past week. Wish I knew why. Hys.ter.i.cal. I needed that just now after my sister and I spent an hour on the phone dissecting politics, etc. Ok, TV confession time…I enjoy Paradise Hotel (which currently seems to be bumped for all the new shows, but I am hoping that the drama will resume.) There is not one single thing redeeming about the show except that I end every viewing thinking, “those people lead such sad lives”. But still, I can’t stop watching. Oh, and the spider thing? HORRORS! I was wondering if you knew about the bloglines thing and if I should tell you. You’re not the only one I’m having trouble picking up btw. On the bright side, I like your blog so much I actually check the old fashioned way. Oh the pain. Jen, your post was great but Martha, I think you win with the doughnut fight! That’s hysterical! This is hilarious. I can’t get the spider out of my mind. I swear I won’t pick up a piece of fruit from now on without checking it for frighteningly poisonous arachnids. Red Stains on church carpet and black widows in grape bags, what a week. Offer it up! You can get at least a 100 souls out of purgatory with those two incidents alone! I am also a Project Runway addict. Have been since the first season. This time, I’m rooting Leanne. Or Jerrel. I guess I’m torn. Anyone but Kenley, really. Although I just saw the final four on Regis and Kelly and Kenley was actually crying and remorseful, so I feel a little bad for her. Still, there’s no way I can root for her after the way she chose to conduct herself. As for the spider… EW. EW. EW. That would be the last time I shopped at that store for fruit! Holy cow, where do I start? That’s one brilliant batch of bullet points you got there. I feel the same way when I pick my daughter up from MMO, that I’m providing bunches o’ entertainment for the teachers and well-put-together moms assembled. I guess you win, though, given that your entertainment is multiplied by 3. I think you can consider watching the Paris Hilton show time well-spent, however. With two girls who will someday become teenagers, you’ll need to be well-versed on the heinousness that awaits them and will need to start now to formulate a plan to neutralize influences like that. At least that was my rationalization the one Saturday morning I watched several episodes of “My Super Sweet 16” back-to-back. Ohhh, you have my sympathies! Every children’s program should have a policy that artwork does not go home until it’s dry! About the spider, I think a letter (not an e-mail, a paper letter) to the store manager is the way to go. Be sure to mention the employee’s dismissive attitude (I mean really, shouldn’t they be eager to remove all spiders from their food, even non-poisonous ones?!) as well. If HEB is anything like Giant Eagle, you’ll receive a gushing phone call from a very concerned person who wants to hear all the details, and you’ll get a bunch of coupons! All without having to confront anyone in person. I have noticed it, and today it’s not updating ANYTHING. Maybe God is trying to tell me to quit reading my friends’ blogs and do something constructive, like be sure my family has clean underwear or something. I’m so glad to know you are a Project Runway addict, too! I’m feeling a little less shallow and vapid for just emailing my sister to tell her I’m counting down the hours until Project Runway! I once got sucked into watching an entire season of “The OC” (because it came on right after “American Idol”, which show I was also sucked into watching). It was the most miserable series of Wednesday nights ever, and I couldn’t wait until the season was over so that I never had to watch The OC again. Man, what a stupid show, but I HAD to watch it every week. Oh, yeah! We had black widow spiders when we lived in Texas….right in our very own back yard! Ew, ew, ew. The giant play yard and the sandbox became obsolete for my 3 young boys (then ages 1, 3, 5) who had really liked playing in the back yard until we saw several black widows hanging out amidst their toys. EW! Oh yeah, we also had at least 3 scorpions casually stroll by me in my very own kitchen. The nerve! Did I mention that I’m not a fan of poisonous spiders, scorpions and roaches. EW! We have since moved to the Midwest. 🙂 I’m not missing being pregnant in the Texas heat and I’m not missing those creepy bugs! HAHAHAHA the “Denounce you on my blog” is a riot! Thanks for sharing you made me smile. Whenever people say that my hands are full, I always TRY to smile and say yes, but it’s a good full. It reminds me of my blessings no matter how the blessing may be acting at the time! OMG, a black widow in your grapes….I would have died. I’m sure the manager would have just dismissed you as……. I grew up in TX and I actually really like HEB. But once upon a time I was a checker at HEB, and I know what you’re talking about. Back in the day they didn’t have special janitors to clean the bathrooms so they made the checkers do it. I, and all my fellow checkers, would just walk into the bathroom and spray some of the cleaner in there and walk back out. Don’t hate me. I would never do that now. I think the “red paint on the floor” episode is a little gift from you to other moms down the line who will have kids in the class: the teacher will NOT be making that mistake again! I think this was a learning experience for the teacher – and that’s a good thing.